HCDP Chair Don Kohn and Stefan Varner, chair of the Democratic LGBT Committee, have expressed deep disappointment in the U.S. Supreme Court’s ruling in a case involving a Colorado baker who refused to bake a wedding cake for a gay couple. 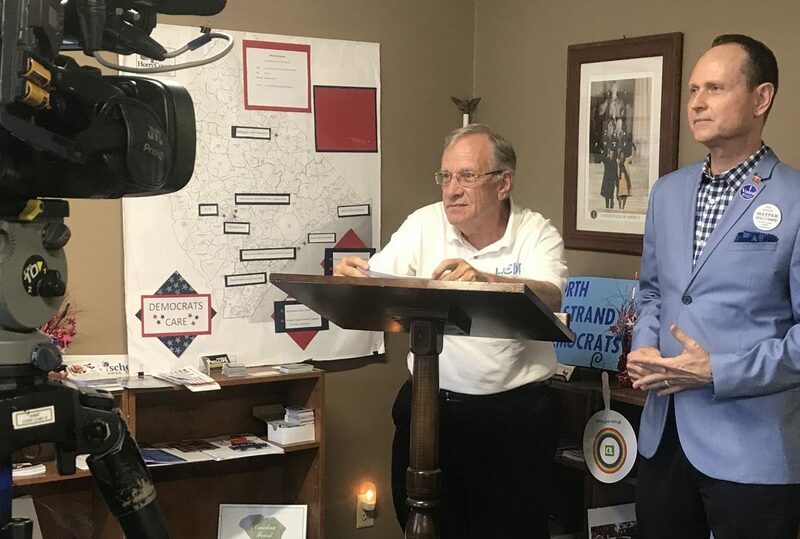 Their comments came in a news conference at Democratic headquarters in Conway June 5. The ruling by Justice Anthony M. Kennedy, approved 7-2 by the court, focused on what he considered to be religious bias by Colorado Civil Rights Commission members who had ruled against the owner of Masterpiece Cakeshop, Jack Phillips. Varner, while disappointed that the decision did not actually address the issue of whether a business, such as the bakery, could discriminate against individuals on religious grounds, said the ruling clearly demonstrates the need for the LGBT community to participate in the political process and to support candidates in the June 12 primary who will work to protect the rights of everyone to be treated fairly without discrimination. He pointed out that another case is coming before the Court. “Hopefully, that case will resolve this issue in the end.” Varner said he hopes the issue of equal protection and fair public accommodation will be adjudicated in a fair and equitable way. “Everyone has a right to be treated equitably and fairly. It is so important that in this political climate that everyone gets out and votes. We cannot afford any more conservative justices on the U.S. Supreme Court,” Varner declared. Varner urged LGBT individuals to support the Democratic Party. “It is the political party that supports LGBT people,” he said. Kohn, too, urged LGBT voters, in fact all Democrats, to vote in the June 12 primary. “Nothing is going to happen unless you get out and vote and make a difference with your actions at the polls,” he said.